As part of his official trip to India, Dr Marco Ferroni, interacted with representatives of CGIAR centers operating in the country. During the meeting held in New Delhi, he discussed a wide range of topics including the dynamics of the current agricultural research environment. Dr Ferroni emphasized on south-south collaboration, with focus on Africa; the new breeding initiative to modernize plant breeding; proper dissemination of research outcomes; and the private sector adapting to market needs, thereby creating value for consumers in the process. ICRISAT was represented at the meeting by Dr Arabinda Padhee, Director, Country Relations and Business Affairs. Other CGIAR Center attendees were representatives of IRRI, ICARDA, Bioversity International, ICRAF, CIMMYT, CIP, IFPRI, IWMI and ILRI*. While in New Delhi, Dr Ferroni met Dr Trilochan Mohapatra, Director General, Indian Council of Agricultural Research (ICAR), and Vice Chair, ICRISAT Board; and Dr Shobhana Pattanayak, Secretary, Department of Agriculture, Cooperation and Farmers’ Welfare. He also met with Dr Chhabilendra Roul, Secretary, ICAR. 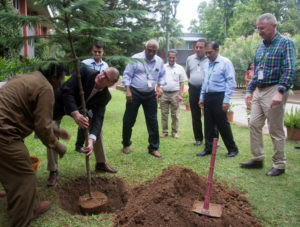 On his visit to ICRISAT headquarters in Hyderabad, Dr Ferroni visited the various departments and facilities and highlighted the need for greater science communication. Later in the day, he planted a sapling in the campus, in keeping with ICRISAT’s tradition for visiting dignitaries. *IRRI (International Rice Research Institute); ICARDA (International Center for Agricultural Research in the Dry Areas); ICRAF (World Agroforestry Centre); CIMMYT (International Maize and Wheat Improvement Center); CIP (International Potato Center); IFPRI (International Food Policy Research Institute); IWMI (International Water Management Institute); ILRI (International Livestock Research Institute).